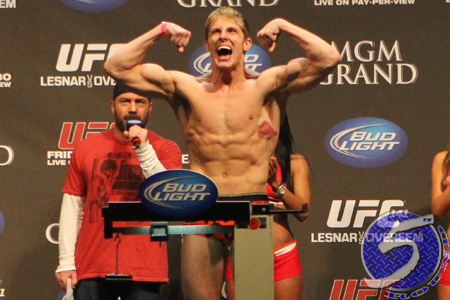 Well, Matt Riddle’s (pictured) tenure with Legacy Fighting Championship was certainly short-lived. Two months after the promotion announced Riddle’s signing, the former UFC welterweight has now joined Bellator MMA. Over the weekend, it was reported by AXS TV’s “Inside MMA” that Bellator bought out Riddle’s contract from Legacy. The Viacom-backed promotion confirmed the news Monday. Riddle will be one of eight contestants competing in Bellator’s Welterweight Tournament this fall. Riddle was fired from the UFC in February after flunking two of his last three drug tests with the organization courtesy of marijuana. The 27-year-old originally won both of those bouts, but they were subsequently overturned to a no contest after his failed urinalysis came to light. Riddle should now be free and clear to continue his blunt smoking ways. According to Bellator welterweight champ Ben Askren, Bellator barely ever conducts drug tests. “Deep Water” holds a 7-3 (2 NC) professional record. All of his scraps have taken place inside the Octagon after graduating from “The Ultimate Fighter 7″ in June 2008.